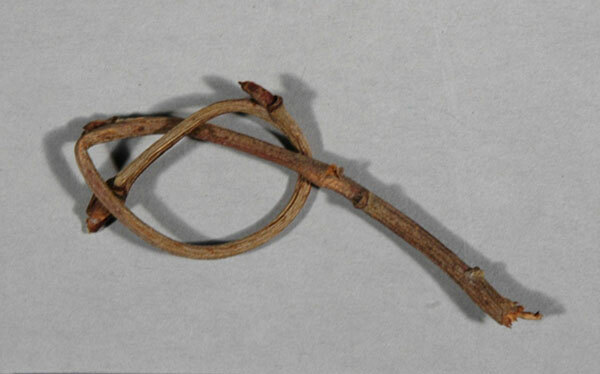 On February 28, 1893, three loops of rowan tree were donated to the Pitt Rivers Museum by Rev. Canon John Christopher Atkinson, from Danby Parsonage, Grosmont, York. (Accession Nos. 1893.18.1-3) These are now on display in Case 31.A - Magic, Witchcraft and Trial by Ordeal, located in the Court of the Museum. The records describe the rowan loops as amulets against witchcraft, but they also appear to have been prophylactic against ghosts, fairies, spirits, and the Evil Eye. All three loops are of different size, one of them measuring 70 mm at its maximum length (1893.18.1). Their provenance is stated alternatively as "England, North Yorkshire, Grosmont [Esk Valley]" and "England, North Yorkshire, Grosmont, Castleton."